Instant noodles are usually sold in dried form which comes with seasoning powder and oil in a separate package. How to cook instant noodles are boiled with boiling water or some being quite the hot water soaked. A However, did you know that there is a danger of instant noodles behind pleasures? Instant noodle-making process begins by mixing the ingredients salt, starch, and other spices with flour. The dough is then stirred, and then inserted into the mold. Once the desired shape, noodles steamed and dried by frying or drying process with hot air. Instant noodles are often referred to as unhealthy foods because of the content of carbohydrate and high fat, but low in protein, fiber, vitamins, and minerals. Additionally, instant noodles served with instant broth usually contains a high salt or sodium. One pack of instant noodles can contain about 2,700 mg of sodium, whereas the recommended sodium intake per day is only about 1,500 mg.
Use of MSG (monosodium glutamate) which improves the taste of instant noodles become more salty, sweet, or sour also have health risks. MSG can trigger allergic reactions with symptoms of chest pain, sweating, palpitations, and headache. High sodium and MSG of instant noodles are advised to be avoided by people with hypertension, diuretic drug users, and users some kind of anti-depressant drugs and patients with congestive heart failure. Instant noodles can increase a person's risk of disease such as diabetes, stroke and heart disease. Another thing to consider when discussing the dangers of instant noodles is the packaging. 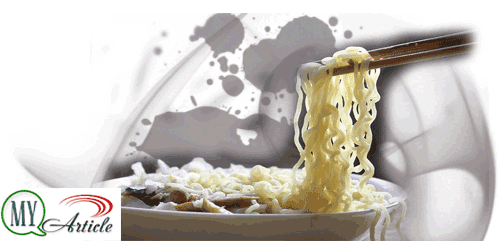 There are instant noodles are packed with ingredients that uses styrofoam containing the chemical bisphenol A (BPA). BPA can interfere with the way hormones work, especially estrogen. When considering the nutritional content of instant noodles unbalanced coupled with supplementary materials that pose a risk to health, you should limit consumption of instant noodles. In an effort to balance the nutrition in the instant noodle dish, you can add some additional materials, such as eggs, chicken, mushrooms, carrots, beans, cabbage, and other natural ingredients. If possible, do not use all the seasoning. Limit half dose because of instant noodles contain MSG seasoning and salt. If you regularly eat instant noodles, consider to reduce them immediately. Increase consumption of nutritionally balanced food, equipped with a healthy lifestyle such as not smoking and exercising regularly. Also remember to read the labels of food products or beverages to determine the nutritional value before you eat them.